I bought the VW Elsa Win product off of ebay. It was kind of a pain to install, but I finally got it on my computer. Now I am trying to view the manual and it is such a huge database I am having a problem finding my specific car. It wants the year, model, VIN, Sales Model, Engine, Trans information. Most if this I have but I do not know the specific engine and trans. Does anyone here have any experience in setting up this Elsa Win program? Thanks for the help. Yes I bought ElsaWin of eBay 18 months ago and it had a free ETKA 7.0 disc. Its not easy to use you may have to register with the company before you can use all functions. If you want to find the year, model, VIN, Sales Model, Engine, Trans information its on the Options sticker which is in the service book. If you don't have the service book the other half of that sticker in on the boot floor next to the spare wheel well. The engine code is BWA 147kw engine. The transmission code JLW. Then the paint code LB9A. The model code is 1K1 3V2. 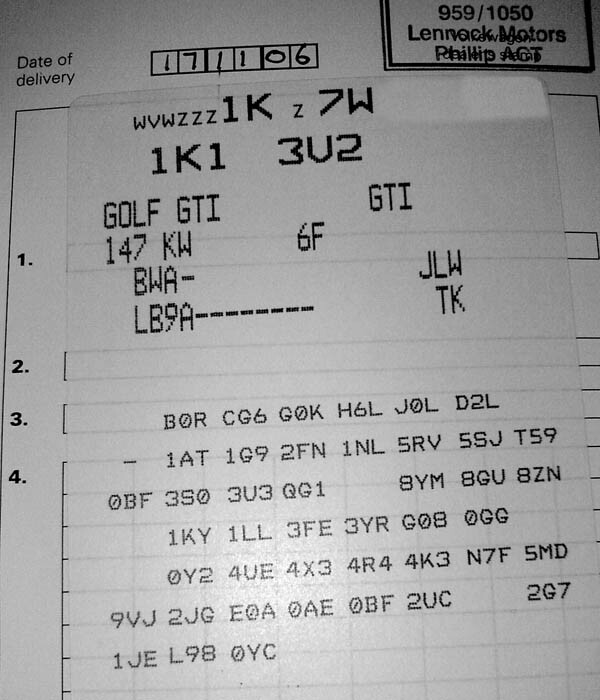 Then the rest are p-codes.